Jonas & Friends performs with a lot of walkabout acts/ walking acts. For the international market they offer three walkabout acts: 'Wood & Wood', 'The Mechanical Horse' and 'Steam Powered Butler JF-09'. These acts can be transported by plane (or train). The other walkabout acts we have (see below) can only transported by car. That's why Jonas & Friends only play with these acts within a circle of 450 km. from Amsterdam. 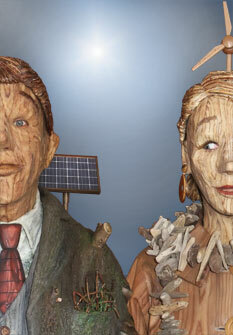 Two fascinating, sustainable, poetic and entertaining wooden mask characters! 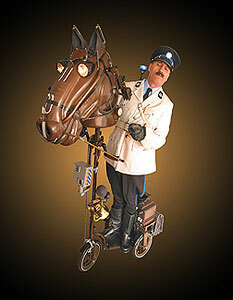 A police-officer, riding on a mechanical horse, is doing his duty when he is mingling with the crowd. 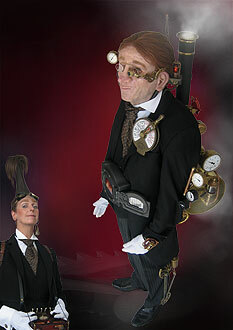 Two butlers, a man-machine with steam technology and his engineer, with little interactive gimmicks. For the Dutch market and the surrounding countries (until 450 km. from Amsterdam) Jonas & Friends have several other walkabout acts. Here below a selection of these acts with some movies. For more information visit our Dutch part of the website. 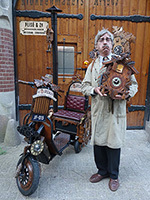 The cuckoo man repairs and sells cuckoo clocks. But unfortunately all his clocks seem to have cures. 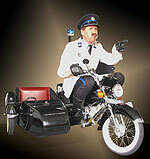 A comical mask duo is driving on their motor-bike, playing small scenes and are responsive to the people. 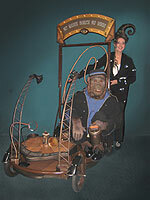 An organ woman and her real looking monkey are showing you their miniscule little organ. 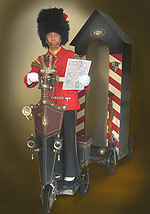 He is on his way to relieve the guard at Buckingham Palace. He does not know what course to pursue, so he asks the people for assistence. 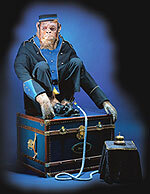 When people are arriving at the party they will meet this monkey at the entrance. They will wonder... is this animal real or not real?! This is what special effects can do! !